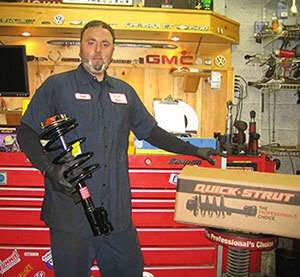 ESP Auto Inc., Services: Shocks/Struts | ESP Auto Inc. Automotive shock absorbers and struts do more than just provide a comfortable ride. Their most important function is to influence the control and handling characteristics of your vehicle. Without them, your vehicle would continually bounce around and bound down the road, making driving extremely difficult. Not to mention uncomfortable and dangerous! Ultimately, shocks and struts are the parts of the car that help keep your tires on the road. They control the action of the spring to resist bottoming out if you hit a pothole and keep the movement of the springs under control when they rebound. Replacing your shocks or struts can improve your braking distance by up to 10 feet. Think about it: that could be the difference in saving a life. Contact us today if you are experiencing any of the symptoms listed above.